Sleep apnea is a disorder that causes sufferers to stop breathing during sleep. There are two types of sleep apnea , obstructive and central. The former can be managed using a Thornton Adjustable Positioner (TAP) provided by the doctors at Peak Family Dental Care in Cottonwood and Flagstaff, AZ. Drs. Bryan J. Shanahan and Ryan Tuinstra offer gentle, non-invasive sleep apnea treatment that can open your airway to allow proper breathing during the night. By improving sleep, you can also find relief from the widespread symptoms that negatively impact your daily life and affect your long-term health. Obstructive sleep apnea (OSA) occurs when your airway becomes blocked repeatedly during sleep, depriving your body of vital oxygen. This blockage is typically caused when the muscles at the back of the throat relax while you are asleep, collapsing into the airway. For patients who sleep on their back, OSA may also be caused when the tongue falls to the back of the throat, narrowing or even obstructing the full airway. The continuous disruptions in breathing lead to interrupted sleep that can have various effects on the mind and body. If you are regularly experiencing these symptoms, it may signify sleep apnea. You should consult your doctor to undergo an evaluation and determine whether you suffer from the condition or if there is another underlying cause. According to a recent study conducted by the American Academy of Neurology, ongoing inadequate sleep can also contribute to the development of dementia or Alzheimer's disease later in life. All of these conditions are serious, and we strongly urge any patients who suspect they may suffer from sleep apnea to seek treatment. Customized, non-invasive oral appliances can help you gain relief from sleep apnea. We typically see patients who have already completed a sleep study and have found that they are CPAP (continuous positive airway pressure) intolerant. During your consultation, we will review your sleep study results and screen your oral health to ensure that you are compatible with oral appliance therapy. Our doctors will use a cone beam scanner to examine the airway and temporomandibular joints (TMJs). If it is determined that you are a suitable candidate for an oral device, we will take measurements and impressions of your bite to ensure proper fit and comfort. Our doctors primarily use the TAP appliance for treating obstructive sleep apnea. 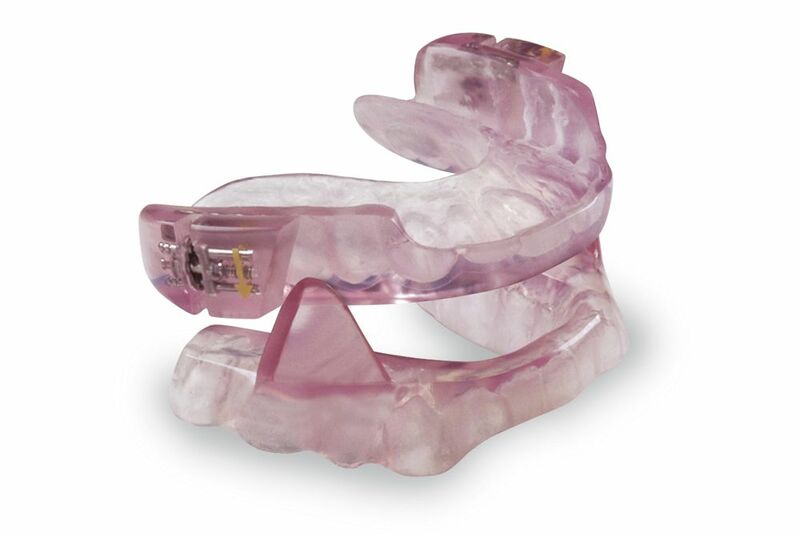 Mandibular advancement devices like this are an excellent option for many patients as they can treat both snoring and OSA. These oral appliances work by gently shifting the lower jaw in a forward position, preventing the tongue and throat tissues from blocking the airway. Your oral appliance will be custom made to fit your bite for a well-fitting device that provides effective relief. TAP appliances allow for customized snoring or sleep apnea treatment as they can be adjusted for each patient's needs. Your doctor can help you determine the degree your jaw should be shifted forward for optimal breathing as well as comfortable wear that should not disturb your sleep. Forgoing treatment for sleep apnea can not only have a negative impact on your daily life but your long-term health. Typically, patients will return for a second visit after two weeks to ensure that their device is comfortably positioned. We also offer at-home screenings that allow patients to track their progress after 90 days. The results of your screening allow us to determine whether your TAP appliance is improving your condition or if adjustments need to be made for increased effectiveness. Regular follow-up appointments can also be made as needed if you feel that your TAP appliance is not the best solution for you. We are dedicating to helping our patients find comfortable relief from OSA and protect their health. If you believe you are suffering from sleep apnea or are unable to successfully treat your condition with CPAP, contact us online or call us at (928) 774-2500 to determine if TAP appliance is right for you.